Actually I rarely cook processed food for my family lunch or dinner meal. However, I was running a little late from work and have to cook up something fast for dinner. 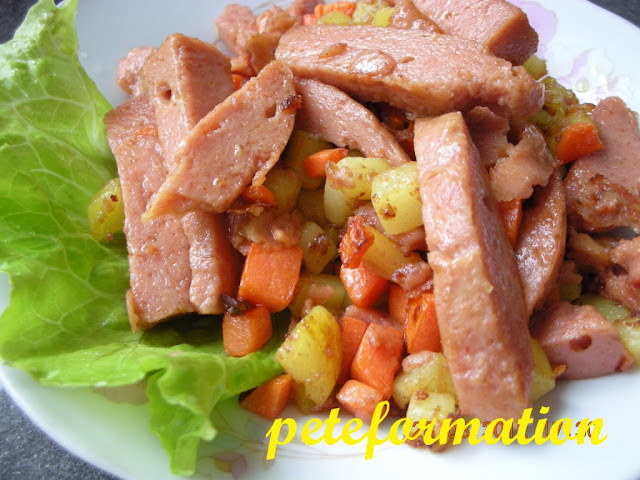 Therefore, I just open a can of luncheon meat, fried them with potato and carrot. I used US Russet potato which soften easily compared to other types of potatoes. My kids love this dish very much! Here is my Quickie Fried Luncheon Meat with Potato and Carrot Recipe. Heat up wok and put in a little vegetable oil. Put in the garlic and stir fry until they are slightly golden brown. Add in the potatoes. Fry until they are well cooked and soft. Throw in the carrot and luncheon meat. Add a dash of pepper. Fry the mixture for a short while. Dish up and serve while still hot! Taste real good with steamed rice. looks great, and I have all the ingredients! What brand? The China Ma Ling ones are not nice anymore... I usually fry with Bombay onions and egg. Hahaha.. 10 minutes can 'kao tim liao'. More important is you children love it. Thanks for the simple fried luncheon meat with potato recipe. If you don't mind, can you submit your simple fried luncheon meat with potato photo in http://www.foodporn.net ? Wow, I like this recipe, i am sure my kids like it too. Must try one day, thanks Pete. Such a lovely dish, quick and looks delicious!